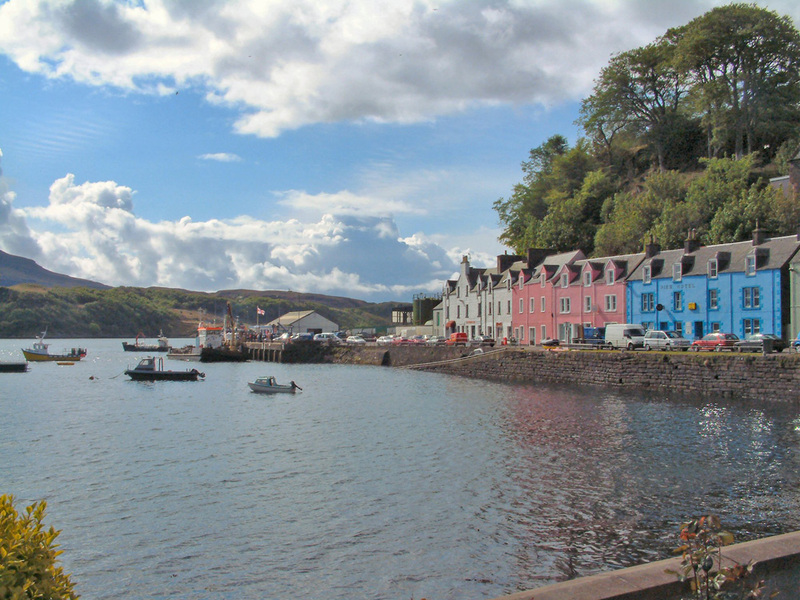 Portree is the main town on Skye. Its name comes from the Gaelic "Port-an-Righ", which translates as "King's Port" and dates to a visit by King James V, plus a fleet of warships, in 1540, to persuade the island clans to support him. It had earlier been known as Kiltraglen. Sir James Macdonald, developed Portree as a fishing port from 1771. From 1826 Portree hosted weekly steamers from West Loch Tarbert via Tobermory, Isleornsay and Kyleakin, while from 1851 the weekly ship between Glasgow and Stornoway called here. In the 1820s Thomas Telford built roads across Skye linking Portree with Uig and Kyleakin. He also built Portree's pier. By 1894 there were daily steamer services to Strome Ferry, and other links to places as far afield as Ullapool, Oban, Lochinver and many ports in the Western Isles. Today the harbour continues to be used by fishing boats, but is also home to a range of other vessels, from pleasure craft to the lifeboat.